When I was a working gal at the daycare, I was in charge of coming up with art activities for the 12 to 18 month old babies. There are not too many things babies can actually do art-wise, so that was kind of challenging. 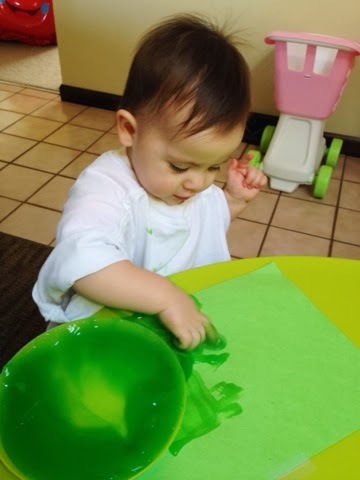 Babies can't do scissors, aren't very handy with glue, haven't really got the skills to use a bottle of puffy paint, but one thing they are REALLY good at is fingerpainting. And eating paint. So we did A LOT of painting. And eating paint. I liked to find different things for my Baby Bears to paint with (and taste) because non-toxic tempera paint gets boring after awhile. 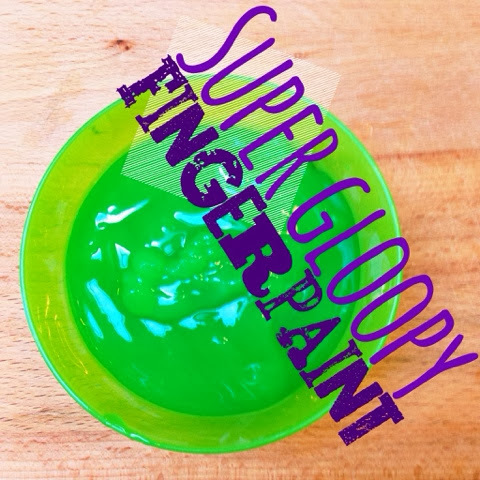 This super gloopy recipe is great for paper or even just painting on the tabletop, it but also doubles as seriously awesome homemade bath paint! The kids at daycare used to love this stuff, probably because it tastes a lot better than the paint from the jug and it's texture is everything! Kinley LOVES this stuff, too. One paper is never enough. Put the sugar, cornstarch, and water in a medium saucepan and heat it up over medium high heat. Keep a close eye on it and stir it pretty much constantly. After a few minutes, it should start turning into a hair gel-like consistency. Once it gets to that point, don't cook it much more, otherwise it will be really hard to paint with. Scoop it out of the pan and add the food coloring. 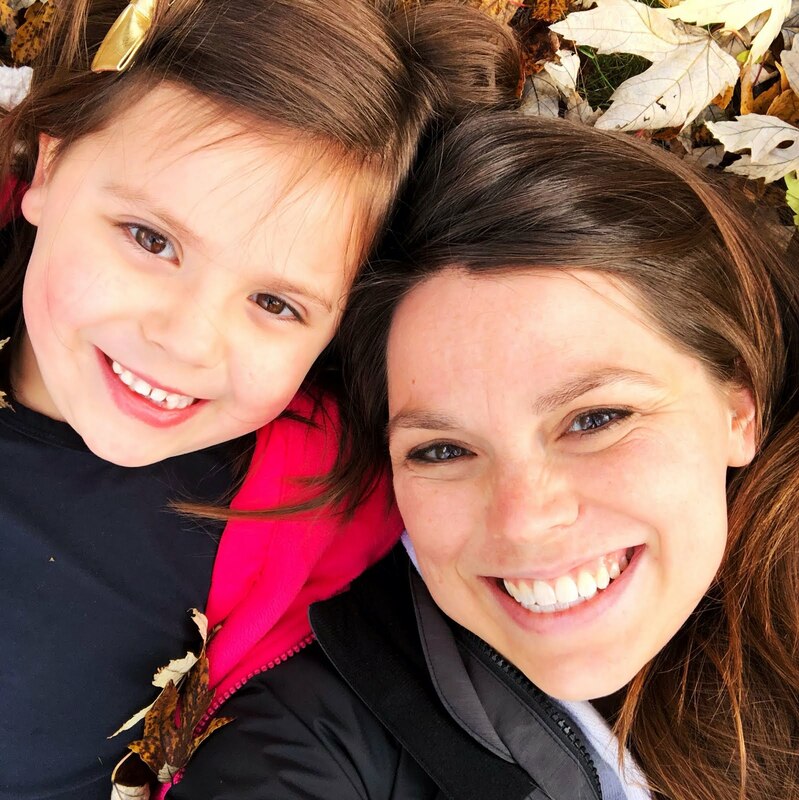 Once it's cool, you are ready to paint! She must've seen me add the sugar ;) I have to admit, I've tasted it. 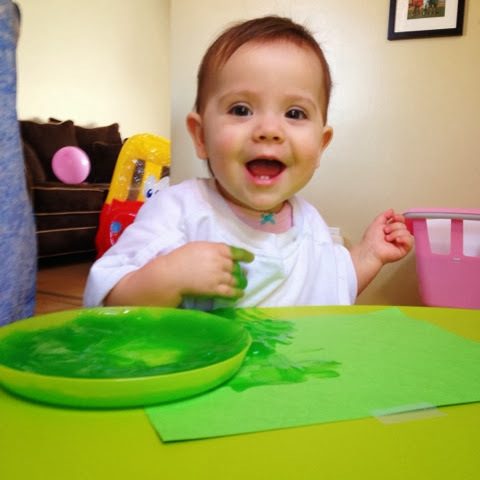 I mean if every kid I've ever known has loved to eat paint, it can't be terrible, right? It wasn't. It wasn't delicious, but not terrible. Tasted like nothing with a hint of sweet. So back to the paint. It's super easy to clean off skin, I've never had it stain any clothes, and it just wipes off tables with a wet, soapy sponge. 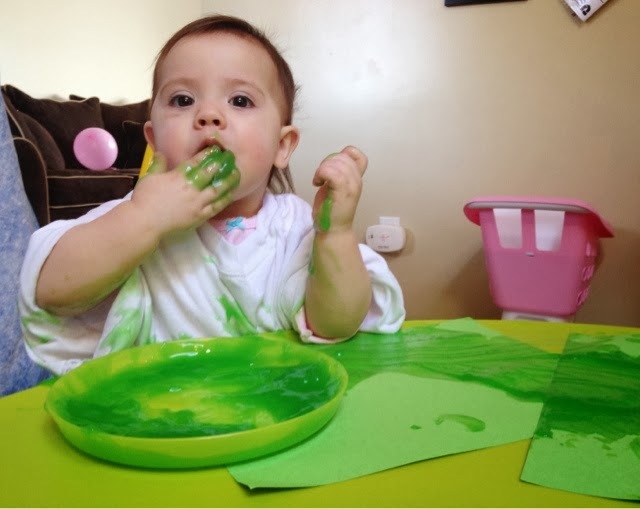 The original recipe calls for a few drops of dish soap to help with clean up, but it's definitely not necessary and not a good idea if your little one thinks paint is food, obviously. If you are using this paint on paper, you will probably want to use a ton of food coloring. I never use enough, I stop when it looks right and when it dries it's pretty much clear. If you use more than you think you need, you'll probably have a better result. 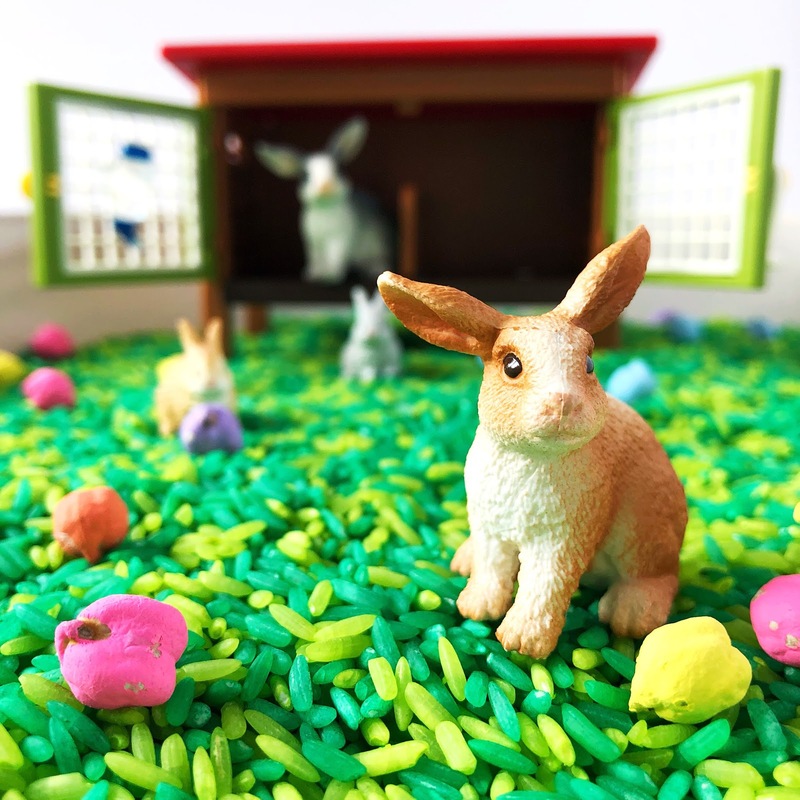 I've never tried using paste food coloring, but that might be even better. We have tried this paint in the tub before, but Kinley was too little and not really into it. I thought it was cool and it came right off the shower wall, easy peasy. You've gotta use this stuff the day you make it cause it does NOT refrigerate well. It turns into a hard chunk. 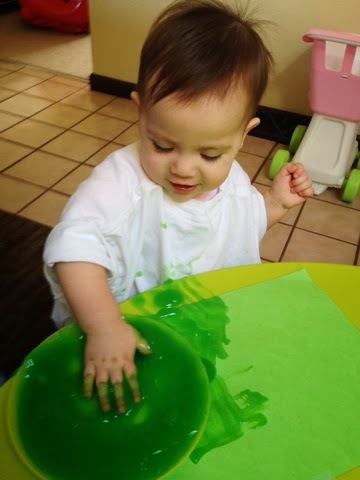 Gloopy paint is great for sensory time, too. Kinley and I had fun squishing it in our fingers and giving each other high-fives with our super messy hands.